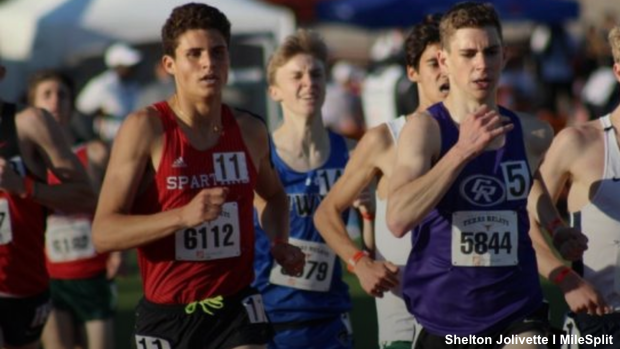 Heading into 2019, Austin St. Stephens senior Crayton Carrozza was one of the last top distance recruits that remained unsigned. On Saturday, the distance star ended the mystery, choosing to ink with the University of Texas. Last year, Carrozza made the jump from good to elite, and he was one of the best runners nationally. He ran PRs of 49.71 (400), 1:50.38 (800), 4:11.79 (1600), 9:15.93 (3200), and 15:25.60 (5K) en route to winning four SPC individual state titles, which made him one of the top recruits in the nation. It also made him one of the most desired recruits of this class. Some of the country's best distance and middle distance programs recruiting Carrozza were Southern California, Washington, Wake Forest, Princeton, Stanford, Texas, Tulsa, Georgetown, Villanova, and Notre Dame. Carrozza, however, still won't be able to run in Texas over the regular season in 2019. He was ruled ineligible from competition during the 2018-2019 season by the Southwest Preparatory Conference (SPC) due to age restrictions. Carrozza turned 19 on August 26, six days prior to the stated eligible date, making him ineligible. But this no doubt is a big catch for the Longhorns. Texas adds one of the state's top distance runners for 2019. Carrozza will team with Cruz Gomez, Haftu Knight, Liam Walsh, Evan Williams, and Trevor Williams next fall in Austin.